Wondering what happened to the AMS Bike Co-op? Don’t worry, we still exist! We’re the programs office for the Bike Kitchen. Check out what’s cool stuff is happening on this page! Click on individual listings for more details, including the location, time and links to further information! Looking forward to seeing you at our upcoming programs and events! LGBTQ2I+ Night takes place on the fourth Wednesday of every month at the shop, from 6:00pm - 9:00pm. This event provides a positive space for anyone in LGBTQ2I+ community to use our shop resources for free in a relaxed environment facilitated by queer mechanics and volunteers. Bring your own bike and fix it with our tools, come with questions and ask away, or just come hang out with other community members and eat some free pizza. Beginners are always welcome! Gender and sexuality will not be policed at this event. We ask those who do not identify as part of the LGBTQ2I+ community to check out our other events. Women & Queer Night takes place on the second Wednesday of every month from 6:00pm - 9:00pm. This free event offers a positive space for cis women, trans women, femmes, and all queer folks to take up space in the shop and learn about bike maintenance in a relaxed environment facilitated by women and/or queer-identified mechanics and volunteers. Fix your bike with our tools or just come hang out. Beginners are encouraged to come and ask all of the questions. Oh, and we provide free pizza too! The Kids Bike Library (KBL) is similar to a regular library, but with bikes! During the summer on Wednesdays from 10:00am – 6:00pm, kids and youth can come trade a bike they have outgrown for one their size (includes bikes with 20” wheels or smaller). Unlike a regular library, you can keep the bike for as long as you need it without having to worry about renewing. Access to the Kids Bike Library is free for Bike Kitchen members. If the membership fee presents a financial barrier, please contact outreach@bikecoop.ca to request that the fee be waived. We’re always looking for bike donations and volunteers to help us build bikes and provide tune-ups. If you’re interested in supporting the Kids Bike Library or have questions about the program, please contact kidsbikes@bikecoop.ca. The Bici Libre initiative recycles bikes and rebuilds them for the use of migrant farm workers across Metro Vancouver and the Fraser Valley. Farm workers that come from other countries via the Temporary Foreign Workers Program often live at the farms on which they work, far from town centres and with limited access to basic necessities. We host the Bike Building Party for Bici Libre regularly at Kickstand in East Vancouver. Subscribe to our Facebook events and our newsletter to get updates about the next Bike Building Party. Donate directly to the Bici Libre project fund and help us supply bikes, lights, locks and helmets to migrant farm workers. Our Cycling Resource Centres (CRCs) are a one stop shop for all things relating to bicycles. We go outdoors to places where cyclists and would-be cyclists already congregate and provide a one-stop-shop to answer any bike related questions they may have. Through the support of UTown@UBC, we offer free CRCs on campus from spring until fall every year. Drop by and get a basic bike tune-up and other cycling resources likes maps and guides. We can bring our CRCs to you! Book us for a CRC at your event, festival, party, workplace or school. The Purple + Yellow Bike Share is a fleet of used bikes available for bike share members to ride within the boundaries of UBC campus. The bikes are maintained by volunteers. Volunteers are the heart of our bike share, investing their time in a resource that benefits the campus community. Come volunteer at P+Y Night at the Bike Kitchen, which takes place every Tuesday night from 6:00pm - 9:00pm. It doesn't matter if you're a pro bike mechanic or if you've never worked on a bike before — this is a great place to try out mechanics and learn. For those who need guidance, experienced volunteers and a pro mechanic will be there to help. There’s no need to sign up beforehand, just drop in. And we offer free pizza for volunteers! The Pedals for the People program was created by Our Community Bikes with the aim of increasing access to bicycles and bike repair for those who experience barriers to affordable forms of transportation. Through the help of volunteers and donors, we refurbish bikes and give them to low-income and marginalized people for free or for a sliding scale donation. 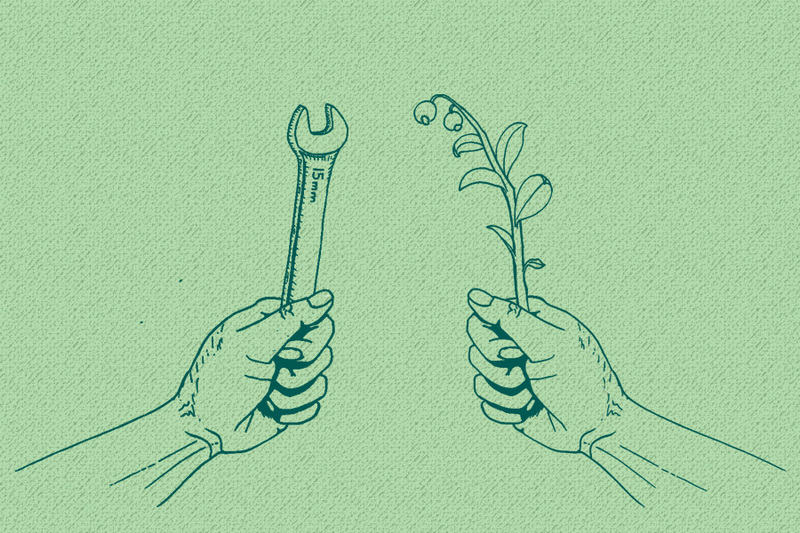 Come to the Bike Kitchen’s Monday night volunteer night to help us build and repair bikes for Pedals for the People. Volunteers also help us build and repair bikes for our Bici Libre program and the Kids Bike Library on Monday nights. We provide free pizza for all volunteers. The Bike Kitchen offers three different workshop series. We keep our workshop prices low to make them accessible to as many folks as possible. However, if the fees present a barrier to participation, you can email outreach@bikecoop.ca and request to have some or all of the fees waived. Subscribe to our newsletter to get updates about when registration opens for our various workshops. 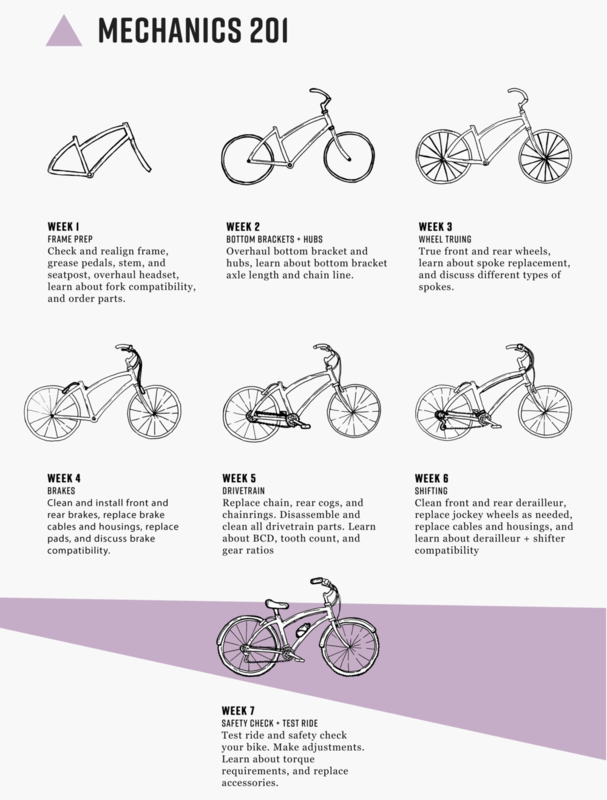 Bike Basics is our most beginner level workshop. In this 3 hour long workshop, you will get hands on experience giving your own bike some care and using the Bike Kitchen’s DIY tool share. Bring your bike to get to know how it works! If you do not have one to work on, let us know and we can provide a bike. During four interactive sessions, you’ll learn about bike tools, parts and the inner workings of our two-wheeled friends. Workshops run for four weeks on Thursday nights from 6:30pm - 8:30pm. REGISTER HERE for May 2019! Knowledgeable mechanics will guide you through the basics of repairing and maintaining each system on the bicycle. Demonstrations are provided in a friendly and supportive environment with small class sizes. Everyone is welcome! No bike required! If you do own a bike, we recommend that you bring it with you so that you can practice repairs on your own bike under the supervision of our instructor – it’s a great way to get to know your bike! 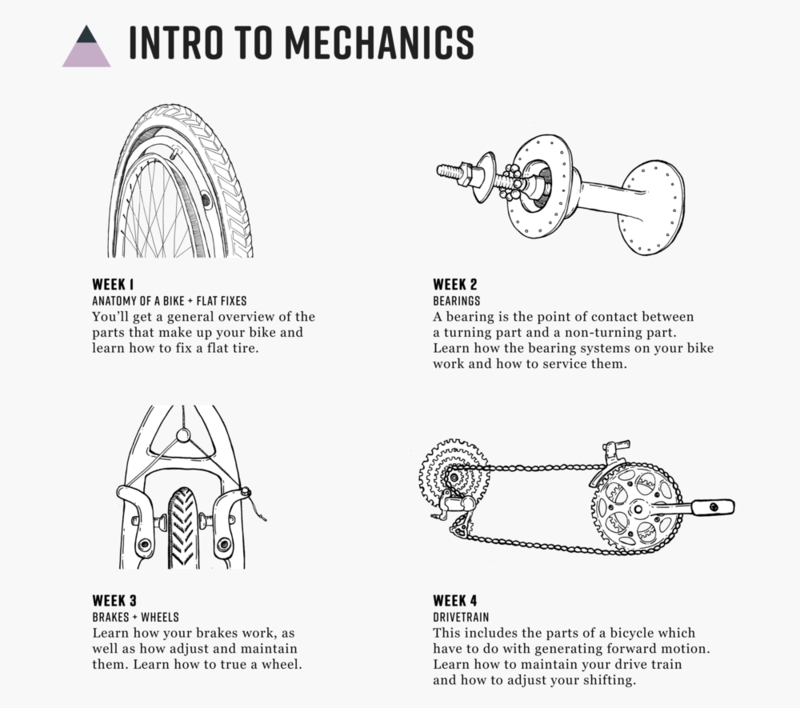 Mechanics 201 offers an opportunity for folks with some mechanical experience to completely overhaul their bikes over eight weeks and under the guidance of an experienced mechanic. Workshops take place on Thursday nights from 6:30pm - 8:30pm. Each workshop will walk the participants through stripping, cleaning, and refurbishing their bike, system by system. By the end of the workshop, participants will have increased familiarity with their own bike, a completely overhauled and tuned bike, and a basic understanding of part compatibility. To be eligible for this course you must have completed our Intro to Mechanics Workshop series or have equivalent experience. If you are not sure if you qualify for this workshop, please e-mail programs@bikecoop.ca. You can book the Bike Kitchen to present a customized workshop for your organization, club, staff, or any group that wants to learn more about bikes and cycling! We offer seven comprehensive modules, from which you can pick and choose so that each workshop is tailored to your group. The topics range from bike touring, to commuting, to basic maintenance. A description and the approximate run-time of each module is listed in the Module Guide. We ask that you select a minimum of two modules. To request a workshop, please contact programs@bikecoop.ca. A staff member will be in touch within three business days to discuss the details of your request.